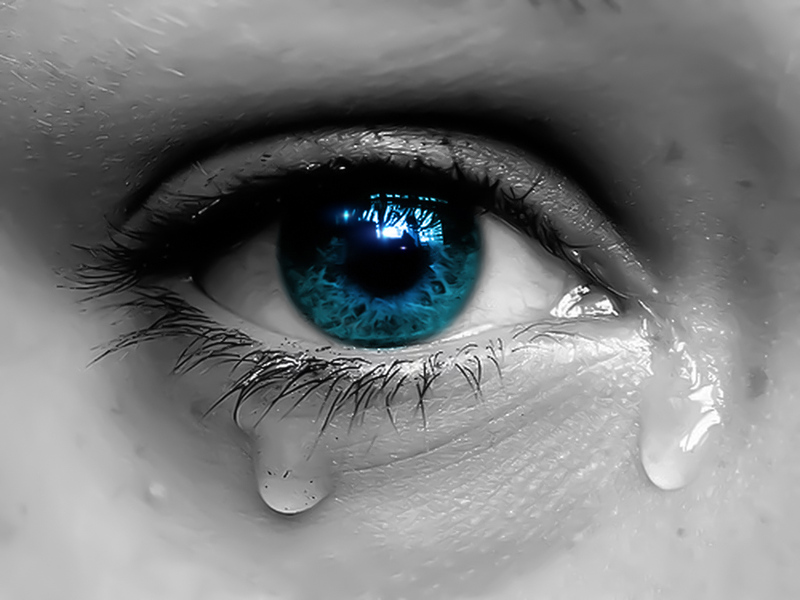 Talking, writing, and/or teaching about violence in society, and ways to reduce it, are always sensitive issues that tend to stir up many emotions in people. Unfortunately, many times, emotions sometimes get the best of people regarding situations, and those situations escalate into those that only fuel maladaptive and/or harmful conduct. Two recent situations that I would like to address include the terrorism at Charlie Hebdo in Paris, France, and the killing of a 12-year-old boy (who was holding what appeared to be a real gun) by a police officer in Cleveland, Ohio. As a person who tries to view all sides of a situation or issue, I am one who does my best to think through it before addressing or weighing in on the subject. My approach is the same in regard to the two above-identified issues. Knowing that these are sensitive and controversial issues that have created tragedy and turmoil, my approach is one that tries to consider and share different perspectives. These, of course, are views that others may or may not agree with, and I understand that. Admittedly, regarding Charlie Hebdo, I know little about this company, but can already see that the satirical cartoons published by it may be offensive to particular people. First, as a Caucasian, Christian, and Westerner, I understand and appreciate people’s freedoms of speech, expression, publication, and the arts. Even if what is expressed is offensive – and certainly, there are plenty of publications and art mediums out there that are offensive – there are protections on them that are guaranteed by official government documents in many countries. For people whose cultures may be middle eastern and/or who practice religions other than Christianity – such as Islam, for example – their upbringing may create views that clash with the majority, including rights enacted within countries in which they live. I am not condoning, nor do I support any kinds of harassment or terrorism – in any forms – however what I am saying is that increased tolerance, understanding, and sensitivity toward peoples and cultures that are not the majority in particular countries must be exercised. People who commit terrorist actions appear to believe they are actually doing a good thing. In the case of those who died as a result of the terrorism at Charlie Hebdo, it seems that the terrorists were acting as martyrs, willing to sacrifice their own lives in seeking vengeance and retaliation (but what they likely believed was justice) for insults to Muhammad and Islam. In their own way (that most likely view as twisted), they believed they were doing the right thing, even though it is completely against Western values in this regard. An issue closer to home – in Cleveland, Ohio – about which I read, online, today is about a 12-year-old boy who was shot and killed by a police officer. The boy had been holding and/or carrying what appeared to be a real gun, but was apparently a replica of a gun that sure looked real to me. I’ve also read about situations in the past in which boys who hold guns, including toy guns that appear to be real, have been shot by police. First, I express my condolences and sympathies for the boy and his family about his untimely and tragic death. This is certainly an unfortunate and devastating occurrence that could have been avoided and prevented. But, what drew me to reading this story are the many questions that I have about it. First, why is a child holding what would appear to be a real gun? Wasn’t he taught not to hold anything that would remotely appear to be a weapon? Why does he want to hold it to begin with? And, hasn’t he been taught that police officers are trained to shoot to kill in these types of situations? This boy’s actions were like inviting suicide. With all of the recent bad news about incidents involving police officers around the country, we must also remember and keep in mind that there are many truly good and helpful police officers who place their lives on the line every day in service to others. Sometimes, it seems that police in some areas have resorted to using increased and unnecessary force. Requiring that police are competent in training regarding the de-escalation of violent and potentially violent situations is necessary. Also, police minimizing, covering up, and/or excusing situations that are clearly wrong and/or which could have been prevented or improved upon only serves to increase public distrust of the very people who are supposed to protect us. So, that brings me back to the boy who was holding what did appear to be a real gun, but was not. Parents must educate their children that our society has drastically changed. In today’s generation, there was the horrific tragedy that occurred at Sandy Hook Elementary School in Connecticut in which so many were killed, including children. In my generation, I noticed the change when the violence at Columbine High School in Colorado occurred. In a prior generation, the change may have been more noticeable as a result of the students who were killed by authorities at Kent State University in Ohio. What I’m saying is that police don’t play – they can’t. Police sometimes have only split seconds to decide on what actions they must take – shoot or not shoot. And, in my understanding and observations, police typically shoot to kill. They don’t shoot to wound or they may end up being those who are killed. Therefore, and as tragic as it is for the young boy who was killed, and his family, children must be taught these things. Guns and weapons – and things that look like them – are not toys. In this day and age, people aren’t playing, especially police. It is up to adults to educate children to act in their best interests. Yes, this boy did a stupid thing, but it is something that could have been avoided. Because he did not, he tragically paid for his mistake with his life. How many more children will be killed by police for holding fake or toy guns because they have not been taught otherwise, are taking unnecessary and dangerous risks, and/or don’t care? People have to remember that police are going to shoot first, and will shoot to kill – that is their training, otherwise they will become the one who falls. There are many other situations of violence that have occurred in our society, especially recently, that I could address here, as well, however these are two that have captured my attention because of the manner in which they could have been prevented in the first place. So, while there is freedom of speech, press, and arts in the West, those from other cultures who now live in Western society may have differing views. Sadly, they are willing to sacrifice their own lives, take the lives of others, and create turmoil out of situations that they appear not to respect, tolerate, or understand. Increased tolerance, respect, and sensitivity is needed on all sides in order to improve relations between people of differing backgrounds and cultures. Lastly, people must not invite tragedy to occur. The boy in Cleveland who was holding what appeared to be a real gun, but which was not real, lost his life because of his actions. This boy was wronged by a society and culture that either did not teach him that holding what appeared to be a gun was extremely risky and dangerous, or it was not instilled in him enough that he not do such a thing. While the boy should have been old enough to understand some consequences and risks regarding his actions, parents must also do more to educate and instill in children not to do such things that invite escalating repercussions that might involve loss of life, regardless of whether the person taking the life was a police officer. May all who have died in these situations rest in peace, and may society learn from these situations so that they do not continue to occur. On January 11, 2015, my son and I took in a Gwinnett Gladiators hockey game at the Arena at Gwinnett Center. 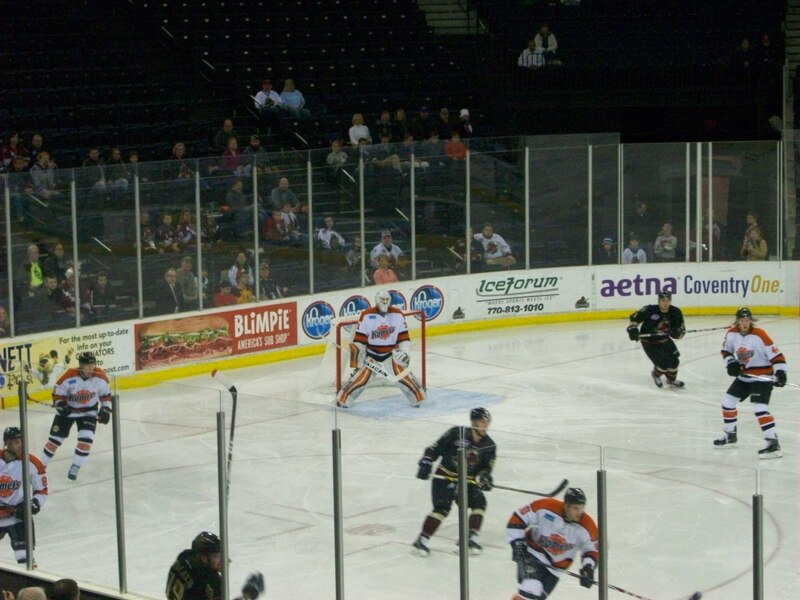 The Gladiators played the Fort Wayne, Indiana Komets. We watched a suspenseful game, including a goal being scored by the Gladiators seconds before the end of first period, the Gladiators getting down by the Komets by two or three goals in the second period, and the Komets ultimately walking away with the win by one goal in the end, 4-3. 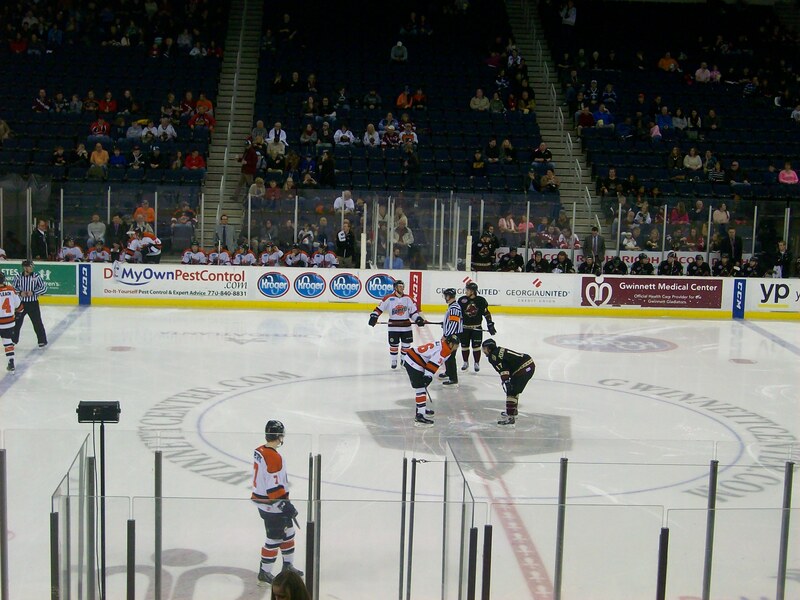 We try to attend at least one hockey game per year, played by the Gwinnett Gladiators. In two past years, my son has earned free tickets to attend two games accompanied by an adult, due to his excellent grades in school. The dentists that care for the hockey players’ teeth have sponsored those tickets, and the games have always been enjoyable to attend. Attending a Gwinnett Gladiators game is affordable, even without getting free tickets. Though ticket prices have risen by a couple of dollars per ticket since last year, I do my best to make time to take my son to at least one game per year. Having spent most of my life in Buffalo, the Buffalo Sabres are one of my all-time favorite sports teams. Having lived in Georgia for the past 15 years, it is nice to be able to take my son to sports games of any type (especially hockey) in my local area that are fun to watch and affordable! Survival means different things to different people. Survival may be a concept that many believe applies only to animals or creatures living in the wild. Of course, there are those “survival” shows on TV, as well, in which people place themselves in risky and dangerous situations for the sake of money, fame, and entertainment. Being smart about survival when outdoor temperatures are too hot or too cold, or when natural disasters occur, saves lives. But, there are additional meanings to the word, ‘survival,’ as well, to be explored here. For people who experience traumatic situations, survival means applying ways to protect oneself in order to continue living, physically, mentally, and spiritually. To many people who are without work, shelter, and/or food, survival means doing what is needed to live for another day, week, month, year. To families where this is the case, survival means sacrifice, sometimes doing without life’s comforts, cutting back on food, doing as little as possible in order to spend as little money as possible. For people who have lost jobs, homes, incomes, marriages, savings, credit standing, and more, survival means sacrifice and doing the best one can to survive every day. What I have experienced in each of those situations is that most people turn away from those who are in need. Most folks are unable to believe it and really cannot stomach it to hear about other’s woes of poverty. When people are so poor that they turn to doing things that are illegal, it does not surprise me, I don’t wonder why. I would not reduce myself to such a level, however I understand why it happens. Most people who “have” keep what they have. There is an incredible level of blindness by the haves toward the “have nots.” And, with the economic woes our country has experienced over the past several years, I, personally, have not experienced improvement. The holidays are the toughest time of the year. One wants to provide for their children for these special times. Thankfully, there are others in my extended family who have more means to provide than I do since I must now live within the bare means. But, it is always saddening and disappointing when folks such as myself are overlooked, even in a basic need for food. No one ever expects to see someone who is Caucasian to be begging, and even if they do, they don’t believe it and are in denial, typically seeking something illegal rather than simply being a good Samaritan. So, this year, I didn’t beg. Instead, I lost weigh by eating less. Cutting out the fattening food and just eating less won’t hurt me. One has to live, or rather, survive. One is not living when each day, week, month, year is a financial struggle. Being a step away from walking or riding the bus instead of having a vehicle, or being a step away from making a home out of the vehicle is not living, it’s surviving. I don’t know how people do it. I don’t know how I’ve survived, but where there’s a will, there’s always a way. I have less, but I am blessed because I have learned to survive with it. Survival of the fittest. The best part about survival is that I have learned much from it. I’ve learned that I can survive on nothing. I can survive on a shoe string. I can use what I have, and when I don’t have anything, I can go without. I will always go without so my family has what is necessary. So, survival has also built my character, my persistence, my perseverance, not that I needed any more of that, however. But, the worst part about survival is that it has also eroded my faith and hope in people. Basically, life is a struggle, so one must be thankful for the good that there is. Sacrifice. Survival. Those are my two words for today. What do they mean to you?